When my Grandmother remembered rationing during WWII in one of our oral history interviews, I nodded my head in a knowing way, because I had read about the rationing of meat, nylons, and, sugar, among other goods. She told me stories of my Great-Grandmother carefully saving her food ration stamps to go to the butcher to buy a special cut of meat for her family. 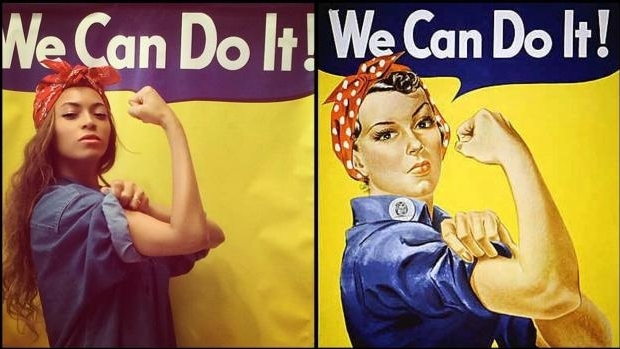 I heard about her aunts and female cousins who took on new roles as their husbands were deployed for service, many joining the Rosie the Riveter movement. I then asked her about the gendered way that she and her family experienced WWII, but told me she had never thought about that. This gave me an insight into the difference between how I view her life and how she thinks about it, but it also presented a problem for me. As an oral historian contributing an interview to an archive, for example, I would want to note that my Grandmother discusses a gendered WWII experience, even if she does not see it that way. When we finished the interview, I asked myself how I, as a historian, could write about WWII without including a feminist analysis, and knew I could not if I were to accurately capture the essence of the time. How can we write about a narrator’s life when our analysis may be at odds with a narrator’s own perception of his or her life? A few weeks ago, Jennifer Egan, a Pulitzer-prize winning novelist, addressed this (among other questions) in her workshop, Jennifer Egan: The Novelist as Oral Historian. She discussed her research for her recently published novel, Manhattan Beach. Writing a novel set in Brooklyn in the 1930s-40s and focused on the Brooklyn Navy Yard, she was tasked with bringing a twenty-first century reader to the WWII era. To do so, she analyzed maps with handwritten notes, letters containing intimate information, photographs, and oral history interviews rich with anecdotes about institutional boundaries and social norms. One woman Egan interviewed recalled falling off of her bicycle while riding near the Navy Yard to get her lunch during a workday. When she fell, the men standing on top of a ship taunted her and sexually harassed her. She never rode a bicycle in the Navy Yard again, and blushed when telling the story even in her eighties at the time of the interview. This woman had a gendered experience at work, which influenced her subjectivity and sense of identity. What struck me the most about Jennifer Egan’s entire workshop was when she mentioned that she initially had not planned on including this bicycle story in her novel. She later realized its importance to capturing the culture of the time, and even its relevance today. The anecdote emphasizes the strikingly gendered challenges women faced even when engaging in everyday tasks, and the quickness with which the men laughed at her accident highlights workplace tensions along gendered lines. Many of the women Egan interviewed told stories of the systemic sexism and misogyny they faced not only in their social lives, but also now in the workplace. However, the women often downplayed the role of this sexism in their formal interviews. During informal conversations, the narrators would often talk more freely about how they felt frustrated by the inequality they experienced. Egan discussed this tension some narrators feel when speaking for the historical record: they want to share their experience but they also don’t want to violate taboos or expose themselves too much. Both Egan and I wanted to label these women as feminists, but the narrators were often resistant toward these labels. Folklorist and oral historian Katherine Borland writes, “for feminists, the issue of interpretive authority is particularly problematic, for our work often involves a contradiction. On the one hand, we seek to empower the women we work with…on the other, we hold an explicitly political vision of the structural conditions that lead to particular social behaviors, a vision that our field collaborators…may not recognize as valid” (‘That’s Not What I Said:’ Interpretive Conflict in Oral Narrative Research). When narrators know they are speaking for the historical record during an oral history interview, they may have stipulations about sharing their thoughts on systemic oppression, such as sexism at work, that they may have faced. This apprehension is important. The ideology of a time period can influence one’s subjectivity, even fifty years later. It is important to document how a narrator may be feeling during an interview and, if possible, the differences in a narrator’s stories before, during, and after an interview. Writing about oral history can take different shapes depending on the narrators and time periods to which they refer, but one of the most effective ways to write about any time period is to analyze these tensions that narrators can feel when recalling their lives. Samantha Lombard is an OHMA student and is one of OHMA’s Communications Fellows. She graduated from the University of Massachusetts Amherst in 2016 and is currently researching Yiddish-speaking immigrants in Boston.